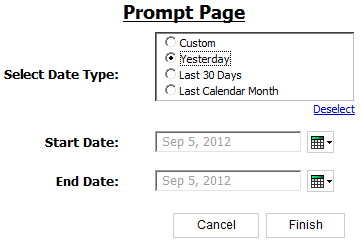 Set the "Default Selections" property to "custom"
Create two Date Prompts and set the "Required" property to "No". Set "Select UI" option of the prompts to "Edit box". We will need 5 HTML Items in the prompt page. Place the first HTML item immediately before the start_date prompt and the second HTML item immediately after the start_date prompt. Do the same thing for the end_date prompt. 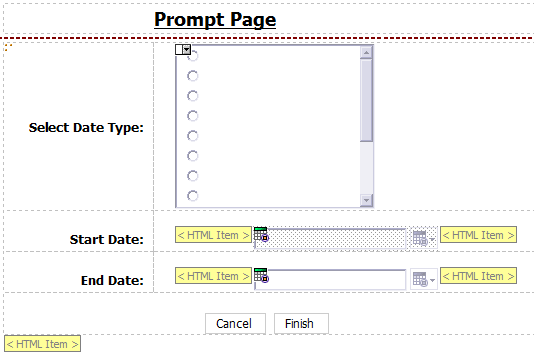 The pair of HTML items before and after the prompts will create a handle for the prompts. Place the last HTML item at the end of the page. This will contain the main script. You can now create two singleton items on the report page and drag these data items to the page. To Date as "Prior Business Day" (Prior business Day is one of the option in the radio box). Can you please help with Java script for the above scenario. Đối với Nhạc gia, Nhạc Thành cũng biết rõ Nhạc gia không hề đơn giản, chỉ cần nhìn Hoàng long thân thể của mình thì biết. - Nhạc gia kỳ thật cũng không phải là suy tàn, phụ thân của ngươi không muốn nói cho ngươi chắc là có lý do, sau này ông sẽ nói, ngươi có hoàng long thân thể, người của Hắc Ám Thần điện dĩ nhiên không bỏ qua cho ngươi, về sau ngươi cần phải cẩn thận một chút. - Hắc Ám thần điện, viện trưởng nói chính là tổ chức bí ẩn đứng đằng sau người áo đen kia sao? - Hắc Ám Thần điện là một khủng bố lực lượng, cho dù Đấu khí học viện và Nhạc gia thời thịnh thế cũng không bằng, không phải là đối thủ. Lực lượng của bọn họ quá lớn, chỉ là bọn họ cũng không ở gần đấu khí học viện nên chúng ta mới có thể chống lại. I am creating a report using Cognos 8.3 and have two queries I am joining. The first query has a pair of required date prompts BeginDate and EndDate. The second query has another pair of required date prompts called beginning_AR_date and ending_AR_date. 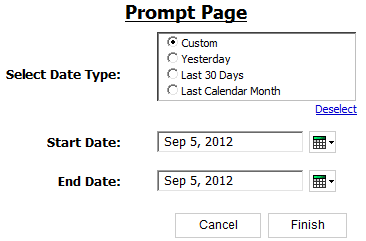 I've created a prompt page with these four date parameters. Since the beginning dates and the ending dates need to match I would like to only show a single pair of date prompts and have these passed to the second pair of date prompts. Is this possible and if so how? You can use BeginDate and EndDate in both the queries. You don't need beginning_AR_date and ending_AR_date at all. Im a regular visitor to your site. My issue is with Legend titles in chart reports. I have a total of 10 titles to be displayed, but only 5 are displaying. I have tried everything including resizing the chart, without success. I believe this can only be done by coding. Im using Cognos 8.4.1. Could you help me out in this please? Hey Sriram This is really good, but when i make other option than custom as default value i see calander still showed up until i select some other value, I think it is not reading any event during load, is there any solution where I can pass hardcoded value where i can have pass in condition 9 as defualt and date prompts dont show up while first load. You can use an onLoad block to do this. How to do this if there are other radio button prompts on the page not related to the date? I have two sets of radio button, one for a separate filter and one for this date functionality. The code doesn't work because I'm presuming it's picking up conflicting radio button values. Hey Sriram, how can i switch off OnClick function, and work with default value on radio button? start_date_prompt.style.display = 'none' -- for hiding. Move this statement from within the ToggleDate() function to outside the function. Same problem as Егор Рогов. code works great in IE but not in FF. How do I adjust to work with FF? This is great. Anyway, I would need to start with disabled date prompts. Is it possible?